Venerable Sāriputta was born in the village of Nālaka near the city of Rājagaha and was known as Upatissa. Venerable Sāriputta was the eldest of the 7 siblings all of whom attained Arahantship and the most fortunate lady Rūpasāri was their mother. At first both of them went to study under the same famous ascetic Sanjaya who failed to satisfy them with his teaching. So both left their ascetic teacher and went their separate ways after mutual promise to keep each other informed of new opportunity to attain peace and the highest truth. “All things are produced by causation. and the Way to eradicate them. Quickly he went to repeat the Dhamma to Moggallāna who also became a Sotāpanna (stream winner). After meeting the Buddha and listening to His Dhamma, Sāriputta became an Arahant. Two weeks later, he was declared by the Buddha himself as the First Chief Male Disciple at the august assembly of Bhikkhus, Bhikkhunīs, Upāsakas and Upāsikās (Buddhist four-fold assembly). He was also known as the General of the Dhamma (Dhamma- senapati). On any important occasion, Venerable Sāriputta would be the right-sided First Chief Disciple, attending to the Dhamma needs of the Buddha. However, when he was not with the Buddha, he would be teaching Dhamma and training the monks under his care. As a filial and grateful son, he went home, with the permission of the Buddha, to establish his Brahman mother in Buddhism. He also succeeded in helping his Brahman mother to attain Sotāpanna, the first stage of Ariyan sanctity. After the conversion of his beloved mother Brahman lady Sāri to be a firm believer in Buddhism as an Ariyan, the Venerable Sāriputta passed away and attained Parinibbāna in his home village of Nālaka in the vicinity of Rājagaha. Obviously the Venerable Sāriputta went back to his native village Nālaka for the benefit of his mother and established her in the Ariyan path; whilst there, he attained Parinibbāna 6 months before the Buddha. His brother, Venerable Cunda solemnly brought back a bowlful of his relics to the Buddha who praised His First Chief Male Disciple and had them enshrined in a Chaitya. Venerable Moggallāna was also born in a village next to Nālaka and in his childhood was known as Kolita. His childhood friend was Upatissa who later became the Venerable Sāriputta. As they were both searching for the highest truth, they went to the same famous ascetic Sanjaya. After some time they left him because he could not meet their quest to end their search for the highest truth. However before parting ways, they promised to inform each other of any opportunity to end their search for the highest truth. Soon after, he was confronted by Venerable Sāriputta who recited to him a four-line Dhamma stanza. He attained Sotāpanna and that was the beginning of the end of his search for the highest fruit as he had entered the Ariyan Stream leading to the end of birth and death (Samsara). He then met the Buddha, heard the Dhamma, and became an Arahant, the Holy or Worthy One, like his compatriot the Venerable Sāriputta, never more to suffer birth and death (Samsara) again. On all important occasions, like Venerable Sāriputta, he would be the left-sided Chief Disciple, attending to the Buddha’s psychic needs as and when instructed. However, when on his own, he was teaching Dhamma or training the monks under his charge. Sometimes he would be sojourning the heavens viewing the celestial mansions as he journeyed on, enquiring about their previous merits done. Likewise he would visit hells, saw the evil doers’ sufferings and returned to give a true account to his student monks and devotees. This made others very jealous and furious. They hated the Venerable Moggallāna so much that they planned and plotted his death, by hiring assassins to murder him. So he was attacked repeatedly until his body was smashed up. As the Venerable Moggallāna was about to pass away, by his superb psychic powers, gathering the pieces of his battered body, he then flew to the presence of the Lord Buddha who was preaching Dhamma at that time. He went to the Buddha to pay his farewell respect and to ask for permission to attain Parinibbāna. When these were done, the Venerable Moggallāna attained Parinibbāna. 15 days after the demise of the Venerable Sāriputta, the Second Chief Disciple Venerable Maha Moggallāna passed away at Kāsasila Stone Slab in Mount Isigiri at Rājagaha. and enshrined in a Chaitya at the gate of Veluvana Monastery of which he was instrumental in its construction as requested specifically by the generous Lady Visākha - donor of the monastery. This Chaitya would be a suitable memorial for people to remember and pay homage. The Venerable Mahā Kassapa was the 3d Chief disciple after the two chief Male Disciples namely Venerable Sāriputta and Venerable Moggallāna. Among the Bhikkhus, whose skill, steadfastness and dedication to achieve moral discipline were incomparable, the Venerable Maha Kassapa ranked foremost. He was born in the village of Mahā Tittha, situated on the outskirt of Magadha province and was given the name of Pipphali Manava. When his parents tried to get him married, he refused. Upon the repeated matrimonial persuasions, he had a statue of a very beautiful lady made and told them that he would marry only if such a lady could be found. As destiny would have it, such a lady was found by the name of Bhadda and so he had to marry her, making his parents very happy. However through mutual agreement, the marriage did not consummate and after his parents died, both of them agreed to renounce the world, each going their separate ways. He received his ordination from the Buddha and was the only Bhikkhu to exchange his new robe for the Buddha’s old robe. Well-known as the “Disciple Foremost in Ascetic Practises”, he used the “Dhūtāṅgas” to obtain purification. This took place 3 months after the Mahāparinibbāna (Great Demise) of the Buddha and was attended by 500 senior-most Arahants, including the new just-attained Arahant Ānanda. 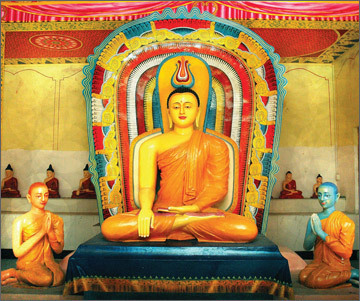 Venerable Ānanda, who was the cousin of the Buddha, joined the Order and became a Sotāpanna. He became the Treasurer of the Dhamma because he was endowed with a unique retentive memory. He was always very soft-spoken and attentive to the Buddha; he served the Buddha very efficiently and always acted as very useful mediator for laity especially the ladies. He attained Arahatship only after the death of the Buddha. At the Buddhist Council, he was chosen to rehearse the Dhamma. He was also instrumental in the establishment of the Order of Nuns. Aṅgulimāla was born in the kingdom of Kosala where his father was the royal astrologer and chaplain to King Pasenadi. His mother was Mantāni who gave birth to him at 12 o'clock midnight, with all the weapons in the city set a-blazing brightly, indicating an unmistakably evil omen. This was especially so when he was born under the bandits’ constellation. However the baby Aṅgulimāla was known as Ahiṁsaka - meaning the “Harmless One” in his boyhood. When he came of age he was sent to Takkasila for an education befitting the young student from a respectable family. He soon became an excellent pupil, loved and trusted by his teacher but was greatly envied by his fellow students who consistently poisoned his teacher’s mind against him.. Eventually they succeeded and thereupon the teacher plotted a vile scheme to destroy him by demanding an honorarium of a thousand right index fingers. This was his obligation as a student. He was very reluctant but was coerced by his teacher who told him that upon completing his mission, he would be instructed in special knowledge to wash off all his evils and would then be endowed with great supernatural powers. Ahiṁsaka did not realize that his involvement with this tempting scheme would eventually lead him to the evil path. Thus the gentle Ahiṁsaka became the heartless bandit, merciless and relentless on killing. He was determined to complete his mission as soon as possible. He spared no one that happened to cross his path, whether it was men, women, or the aged; even the infants were brutally killed and their right fore-fingers cut off. Soon he became the cruel notorious murderer Aṅgulimāla who wore the “garland of fingers” of his victims. For years Aṅgulimāla terrorized the countryside and in the forest Jālinī where he stayed. The people were so frightened and angry that they went yelling at the King’s palace, demanding for the notorious bandit Aṅgulimāla to be captured and killed in order to protect the people. So the King at last led an army of soldiers to capture Aṅgulimāla dead or alive. For the great love of her son, mother Mantāni started out for the great Jālinī forest to find Aṅgulimāla. When Aṅgulimāla saw her, he was blindly excited and rushed after her to cut off her finger and to complete his mission of the thousandth finger. At this juncture the Buddha who was of great compassion came to the rescue and appeared walking leisurely in front of Aṅgulimāla. Immediately Aṅgulimāla rushed after him instead to fulfil his mission but was baffled because even by running furiously fast, he could not catch up with the gently walking Buddha. Exhausted and frustrated he stopped running. Thereupon he shouted for the Buddha to stop but the Buddha replied that He had stopped; only Aṅgulimāla was still running! Still more baffled he shouted to the Buddha that He was lying because He was still walking! Then the Buddha turned around and told him that He, the Buddha, had stopped doing evil, gave up running after pleasures, stopped unwholesome thoughts! Saying so, He expounded to Aṅgulimāla the Dhamma. After hearing the sermon, Aṅgulimāla was jolted into reality and immediately changed for the better, joined the monkhood and followed the Buddha back to the monastery. When King Pasenadi met Aṅgulimāla at the Jetavana Monastery, he pardoned Aṅgulimāla as he was then a monk. However his life as a monk was not an easy one because everyone still hated him and bore vengeance in their heart. Some, still frightened of him, would throw sticks and stones that struck him, made him bleed. Sometimes things that were not thrown at him would somehow come to hit him. So every day he would come back bruised and injured from his alms-round. The compassionate Buddha knew and saw his plight, advised him to be patient and practised diligently. He followed the Buddha’s advice and before long attained Arahantship. Gradually all came to love and respect him at the end. The compassionate Buddha taught him a brief short verse to ease her suffering. I have not taken any life nor cause any suffering to anyone”. “By this Truth sister, may you be well and happy. This made the maternity event a happy and painless one for the mother and her child. And so the Venerable Aṅgulimāla was able to live a happy Ariyan life thereafter.